I’ve loved taking Epsom salt baths for many years and recently started using Dead Sea salt. The minerals from the Dead Sea are known for their amazing healing properties and many people travel long distances to soak in its healing waters. My skin always feels so clean after these baths. My muscles relax and I sleep better as well. Just mix 2 cups of Dead Sea salt into a hot bath and discover the benefits of Dead Sea salt baths for yourself. The aroma of lavender soothes the restless mind and helps you get into a peaceful state. If you have problems sleeping, taking a lavender bath before getting into bed should help you sleep easier. Whether you are using dried lavender flowers or essential oil is up to you. Personally, I use aromatherapy bath salts because the essential oils mix nicely with the salt, and there is no clean up in the bath after. The bath salt only takes a few drops of pure lavender oil to be ready. You can also make bath oil mixing essential oils with a carrier oil to put in your bath. This will leave your skin very soft, but can also leave your bathtub messy. If you have flowers you can put them in a mesh bag and soak them in the water, like a tea bag. This can avoid the clean up of flowers going down the drain. Eucalyptus oil is very strong and helps tremendously with tired or injured muscles. It is also used as a great antiseptic and antifungal remedy. Those with athlete’s foot or who suffer from foot fungus should make a detox foot bath with eucalyptus. 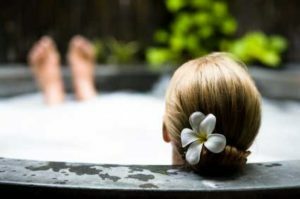 Those suffering from sinus problems as well can receive great benefit from an invigorating eucalyptus bath. Ginger baths are very good for circulation and help to warm up the body. Ginger root has been used in Asia for centuries to increase youthfulness and help keep the immune system strong. The older the root of the ginger, the better. Confucius was said to soak in a hot bath while cutting a ginger root into the water. If you decide to use ginger oil, make sure to mix the oil well before getting in the bath. The oils tend to float on top and you want to make sure not to get a concentrated amount of ginger in a sensitive area. These are just a few of my favorite baths. Many alternatives are available, and I will keep you posted with other fun detoxifying baths to try out.